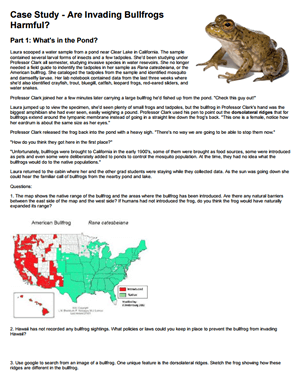 Students follow a story about an ecologist and a student who are studying the population size of bullfrogs in California. These amphibians are considered an invasive species in that area and have been causing the decline of native species. Students learn concepts related to community interactions and learn one species can cause the decline of another species as described by the competitive exclusion principle. Students also construct a predator-prey graph that shows the relationship between the number of bullfrogs and the number of bass fish in lakes. Bass were introduced to help control the bullfrog population because they are known to eat juveniles and tadpoles. Students must make a judgement about whether it is appropriate to introduce another non-native species to control bullfrogs. Students also compare other methods of population control, such as toxicants and trapping. Finally, students must write a recommendation which suggests the best way to control the frogs.